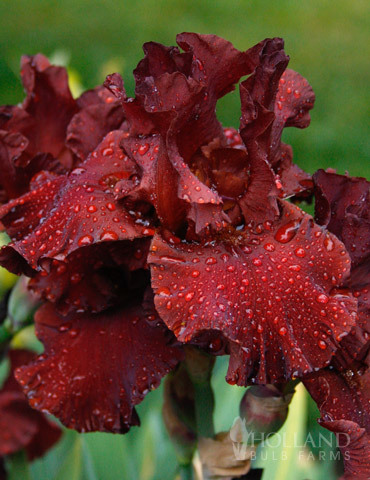 War Chief Bearded Iris has been refered to as one of "the best red irises". It has large 6" velvety red/scarlet blooms that do not fade in the sun. This robust grower will bear 8-9 flowers per stalk. Soil that drains well is essential to the health of your bearded iris. Amend soil with organic matter such as compost, manure or peat moss prior to planting. Bearded Iris should be planted at least 6 weeks before your ground freezes for the year. The earlier in late summer or early fall you can plant bearded iris the better results you will have. Bearded Iris are quite sensitive to planting depth. Plant so that the rhizome is partially above ground, typically this planting depth is 1-2” below the soil surface. Bearded Iris will multiply over time, space according to package instructions. Water the planting area immediately after planting to eliminate air pockets. Bearded Iris are sensitive to rotting, any additional water in fall or winter is not required. Excellent rhizome, look forward to seeing it bloom next year!